Judge Fanon A. Rucker was born and raised in Gary, Indiana. He graduated from Hampton University and the University of Cincinnati College of Law. After completing his studies and passing the bar, Judge Rucker became a Cincinnati prosecutor. After several years as a prosecutor, Judge Rucker entered private practice where he focused on the areas of Civil Rights, Employment, Municipal Law and general civil litigation and also served as the prosecutor for three villages. Judge Rucker represented clients in many high profile civil cases in State and Federal Court at both the trial and appellate levels. In 2007, Judge Rucker was appointed to the Hamilton County Municipal Court. Judge Rucker served as an adjunct professor at the University of Cincinnati for several years where he taught a class on law history. Judge Rucker’s biggest contribution to the legal community is the mentoring he provides and has provided to high school, college and law students, as well as young lawyers. Judge Rucker has served in leadership on numerous boards and organizations. His motto in leadership is “plan to leave it better than you find it or let someone else take the lead.” Under his leadership, the Black Lawyer’s Association membership rolls significantly increased and a multi-tiered mentoring program was initiated. As head of his Masonic Lodge, he implemented several new initiatives, including a successful sustaining fish fry and church visitation program. He was one of the primary architects of a joint effort between the NAACP and the Masonic Order in a continuing voter education series. He currently serves as the president of a foundation that funds initiatives focused on ensuring transparency and participation in local government. Professionally, Judge Rucker has authored more than four hundred written decisions, occasionally appears on a national news talk show discussing court topics, hosts student law clerks year round and serves the elected Secretary of the state association of municipal and county judges. Judge Rucker has been called upon by the Supreme Court to serve on various boards and commissions. Judge Rucker can often be found delivering messages from church pulpits, giving keynote addresses to large groups on a variety of subjects, speaking to students or community groups, serving as an emcee for public or private events and even delivering spoken word poetry to various groups. In his “spare” time, the judge enjoys mentoring, public speaking, studying and fishing. 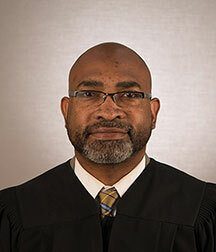 His father, Robert D. Rucker, Jr., served for 18 years as a Justice on the Supreme Court of Indiana. His mother, Jacqueline Pace Rucker is a lawyer and the immediate past director of a faith-based social services agency in Harrisburg, Pa. Judge Rucker is married and is the father of three children, two daughters and a son.